It started as the most mundane of requests. One evening in late September, after a long day’s work, a light bulb flickered out in the dormitory that housed Carlton Robinson[i] and twelve other Jamaican men for the duration of their contract work on a farm in Vanessa, Ontario, about 65 kilometers southwest of Hamilton. For unclear reasons, it fell to Carlton to report the faulty lightbulb to the farm owner, Vincent Geerts. Perhaps he thought nothing of approaching his employer about such a quotidian matter; or maybe he was anxious as he walked over to the farm house in the twilight hour. Regardless of what he expected, once Carlton reached the house and asked for a replacement bulb, things began to go very poorly, very fast. Though it was a Wednesday, Carlton found Geerts drinking with a friend. The friend, described in known archival sources only as a “French-Canadian” (and not named), quickly engaged Carlton in an argument and challenged the Jamaican man to a fight, a challenge Carlton declined to accept, instead returning to the bunkhouse. The matter did not end there. Later that night, as the thirteen Jamaican coworkers and housemates settled in for the evening, Geerts’ drinking buddy burst into the bunkhouse. Reeking of alcohol and brandishing a shotgun, he threatened to shoot the men for causing trouble to his friend. Terrified, the men fled the property and took refuge at a farm seven kilometers down the road, where five compatriots were employed. There they set up a rotating night watch to stand guard against a possible renewed assault. They also called the Jamaican Liaison Officer responsible for their wellbeing in Canada to report the incident. The thirteen Jamaican men employed on Geerts’ farm had likely counted themselves lucky when they were selected to come to Canada as part of the pilot program, which brought farm workers to Canada to work on temporary contracts, first from Jamaica and in later years from other Caribbean countries and Mexico. Just 264 men participated in the arrangement that year. A similar agreement had existed between Jamaica (and other British West Indian islands) and the United States since 1942, and spots in both the Canadian and U.S. programs were highly coveted, given the high rates of un- and under-employment in Jamaica and relatively high wages on offer in North America. Prospective workers had to apply at the Jamaican Ministry of Labour, prove two years’ experience working in agriculture, and pass medical and criminal background checks. It also helped if their local Member of Parliament happened to represent the ruling party of the day. All told, it could often take years of waiting before one’s number was finally called. Once having secured a spot in the program and before departing for Canada, workers were briefed by government officials who stressed to the men that they were not only travelling to Canada for the benefit of themselves and their families; they were also representing their country. A positive experience in the pilot year would ensure the continuation and expansion of the program, allowing for more compatriots to participate, more foreign cash to make its way to Jamaica, and would push the newly independent nation into closer diplomatic ties with Canada. The program’s early participants undoubtedly took their mandate seriously. 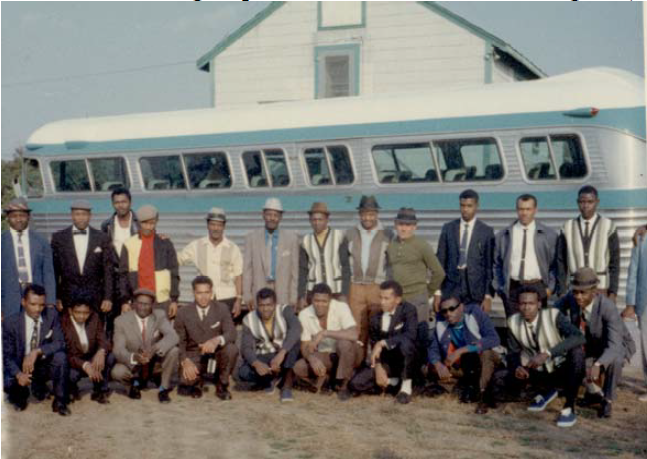 A photograph from one of the first years of the scheme shows a group of newly-arrived workers at their assigned farm in the Niagara region, posing alongside their employer in front of the bus that had transported them from Toronto International Airport. The men are dressed in their Sunday best, many sporting full suit, tie, and hat. Looking at the photograph, it’s not much of stretch to surmise that many of the men took considerable pride in being among the first participants in this program. One of the first groups of SAWP workers, Niagara, c. 1967. From Janet McLaughlin, “Trouble in Our Fields: Health and Human Rights among Mexican and Caribbean Migrant Farm Workers in Canada” (Ph.D. diss., University of Toronto, 2009). On that night in September 1966, as the thirteen Jamaican men traversed the dark rural roads of Norfolk County, in flight from a drunken gunman, alongside their fear must also have surged a profound disappointment in their experience in Canada. They had been appointed as honorary diplomats, advance emissaries in the building of a modern, independent Jamaica. But what diplomats were forbidden from traveling with their families, were housed in cramped, shared quarters, and toiled twelve hours a day, only to be forced out of their temporary barracks at gunpoint in the middle of the night? The men likely had plenty of time to think about all this. While it’s not clear exactly how they traveled to the neighbouring farm, if they had walked it would have taken about an hour and a half. Upon receiving the phone call from the stranded workers, Jamaican liaison officer Noel Heron set the wheels of bureaucracy quickly into motion, alerting his Canadian colleagues, who arrived on scene that very night. Both countries’ officials, however, demonstrated little interest in pursuing justice for the aggrieved men. In the two known archival documents that discuss this incident and its aftermath, no mention is made of the assailant after his violent actions. There is no evidence that police were ever called or charges ever pressed. A few weeks later, after settling these logistical matters, Heron and his Canadian counterparts met with Geerts and his attorney. Were they working out some arrangement for Geerts to compensate the men for their traumatic experience and unlawful ejection from their residence and place of work? No. Instead, the meeting was concerned with determining what percentage of the men’s transportation to and from Canada Geerts would be responsible for. Under normal circumstances, employers in the program in this period covered workers’ complete round-trip airfare. Since Geerts had not employed the men for their full contracts, his lawyer reasoned that he should not be liable for the full cost. Astoundingly, Canadian and Jamaican officials concurred with this assessment, and though they wrangled about the precise figures, in the end agreed to refund Geerts a pro-rated amount of the transportation costs he had already paid, a sum of $1,294.50, including $48 from the Jamaican government. Yes, you read that correctly. The man whose inebriated friend chased thirteen blameless workers off his farm at gunpoint late at night not only went unpunished; he in fact received a hefty refund on payments already made. In the 53 years since this incident, the SAWP has grown exponentially, now bringing upwards of 40,000 workers to Canada each year. Other agricultural guestworker programs have joined it, supplying Canadian agri-business with workers from across the globe. This anecdote from the first year of the SAWP neatly encapsulates two core aspects of the program’s past and present, true throughout its history: the extreme vulnerability of its workers, and the stubborn refusal of its administrators to see profound problems in the scheme as anything other than bureaucratic hiccups. In 2017-18, Employment and Social Development Canada, in cooperation with Agriculture and Agri-Food Canada, conducted a review of Canada’s temporary foreign farm worker programs, releasing the final report in February 2019. Drawing on consultations with over 490 stakeholders (including employers, workers, activists, and scholars),[iii] the report noted major “issues” and also made some mild recommendations, most of which were concerned with streamlining processes for employers. Like their predecessors in 1966, the bureaucrats and paid consultants behind this review, upon releasing the final report, likely found the matter to be “amicably settled.” The workers whose voices are barely audible above the din of official documentation surely felt otherwise. Edward Dunsworth is a Contributing Editor at ActiveHistory.ca and a (nearly done!) PhD candidate in the Department of History at the University of Toronto. He tweets at @ehewey. [i] The names of the thirteen Jamaican men involved in this story are not known. I’ve given the worker who reported the burnt-out lightbulb a pseudonym in an effort to foster a more empathetic connection with him and the other workers. The name Carlton Robinson was chosen by combining the first and last names of two Jamaican workers from 1966 whose names are listed in archival records. [ii] The anecdote relayed in this article is based on two archival documents that discuss the incident and its aftermath. F.J. Black to L.F.D. Coulson, 29 September 1966, and R.M. Mackie to L.F.D. Coulson, 25 October 1966, both located in Department of Manpower and Immigration, RG118, acc. 1985-86/071, vol. 81, file 3315-5-1, part 2, Library and Archives Canada. Some supplemental information about Vincent Geerts was gleaned from searches in the Simcoe Reformer. [iii] I was one of the scholars interviewed.